We are often asked about how we hand dye yarn. The Yarns are dyed in small batches, with each skein having its the colours applied individually which means every skein is totally unique within its colourway. The dyes we use are commercial grade acid dyes. 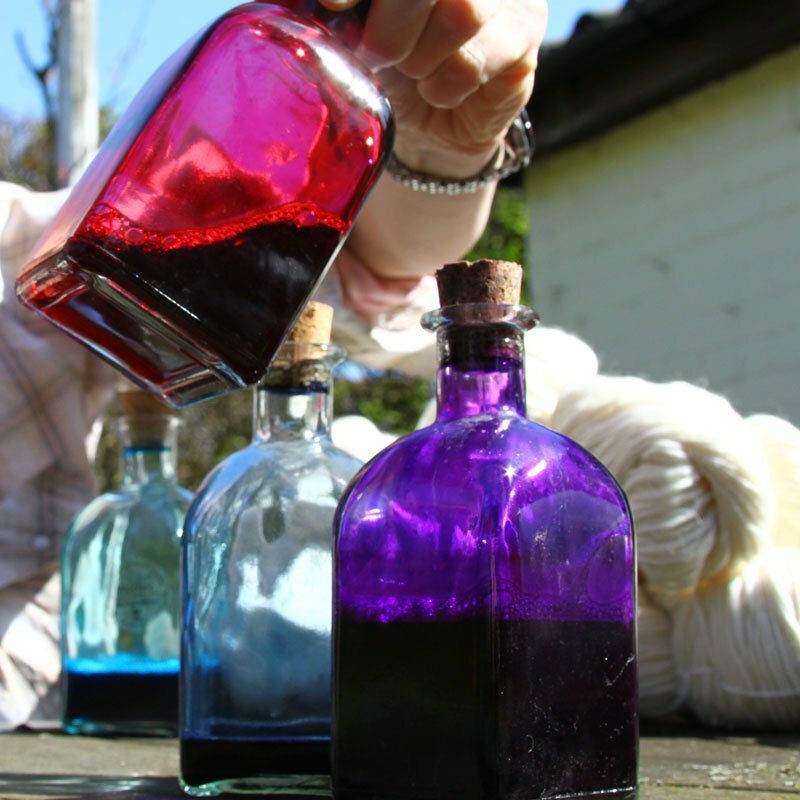 Acid dyes might sound a bit alarming, but the only acid involved is actually acetic acid more commonly known as vinegar. Soaking the yarn in this mildly acidic solution and heating the dyed yarns are the two elements that make the colours set on the yarn. We use a variety of methods when applying the dyes. The undyed yarn is soaked in a vinegar solution which creates the correct ph for the acid dyes and then the dyes are applied by hand using a hand painting technique. This I describe as being like watercolour painting. The yarn becomes the canvas and the dyes are painted on, creating random patterns with small repeats of colour. The yarn may be used quite wet or better drained out of vinegar solution depending on how much I want the colours either blend into each other or stay more distinct. Once the dyes have been applied the yarn is steamed to set the dyes and then allowed to cool overnight to fully absorb all the dyes. For these yarns, I heat the yarn in an acid bath and apply the dyes directly to the yarn in the bath allowing the colours to gently flow and combine. Once the dye has become absorbed into the yarn I turn the yarn applying more colours to any undyed areas and layering colour. You can’t have missed the speckles that have been appearing on yarns recently. This increasingly popular dye pattern involves a combination of techniques and speckled sections. To achieve fine strongly coloured speckles we sprinkle undissolved dye particles to areas this has to done very carefully and not allowing the dye to dissolve too quickly and run. This entry was posted in Yarn Infomation and tagged hand dyed yarn, yarn.